Alex Honnold has been pushing the boundaries of climbing for years. His passion is free soloing – climbing without a rope, often thousands of feet off the ground. Since he’s best known for his “death-defying” hobbies, it’s no surprise that the phrase “Alex Honnold death” does get about 150 Google searches a month, so some folks are wondering about his status. (Incidentally, the phrase “Alex Honnold girlfriend” gets about 500 searches a month, so that’s another status people are curious about.) Obviously, what Alex does is dangerous, but when I heard him talk about it in 2010, he was very laid back about the risks. His secret? He just doesn’t let go. He doesn’t put himself in positions where he might fall. He is confident in his abilities and knows the difference between a no-fall and a yes-fall zone. And so far, his system is working. Alex dropped by Peak in 2010 for a competition. He’s pretty tall in real life. 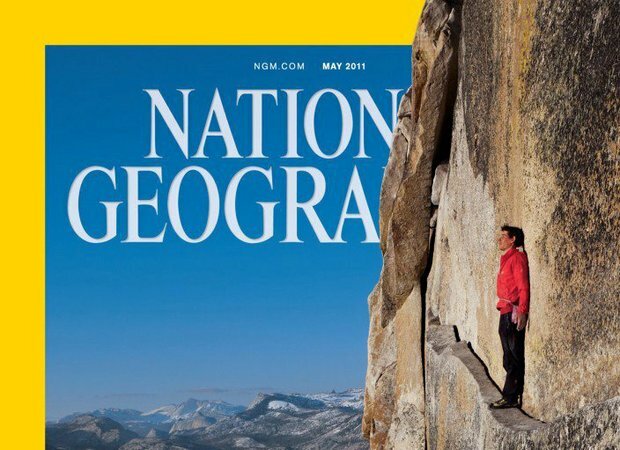 In 2011, National Geographic put Alex on their cover for a feature about Yosemite. The piece was well-written and researched, and opened with a story of Alex losing confidence momentarily thousands of feet off the ground. It had a happy ending (of course) and referred to Alex as a hero whose storied feats on the rock are the stuff of legend. And they are – for better or worse. The North Face is one of Alex’s primary sponsors, and I recently came across a video of Alex, doing what he does, climbing high in Yosemite Valley, ropeless and unafraid. If you can watch that video without a spike in your heart rate, you may have icewater for blood. And when I posted it on my Facebook feed last month, it raised an interesting question: is North Face doing a disservice by glorifying an incredibly dangerous activity? On the one hand, anyone who looks at what Alex is doing thinks he’s maybe a little bit nuts. It’s hard to justify taking that kind of risk unless you’re as confident as he is – remember, Honnold eats 5.13s for breakfast. You’d have to be incredibly confident to attempt the routes he’s free soloing on a rope; showing us the extreme ends of the sport isn’t necessarily enticing us to try it for ourselves. And the National Geographic piece took us to the cliffs with Alex while he had a momentary lapse in that confidence – almost fatally. On the other hand, The North Face video linked above presents Alex without comment or context. Lots of people climb really hard, and not all of them are engaging in Alex’s style of extreme free soloing. When The North Face makes movies about Alex Honnold, rock climbing rock star, are they setting him up as a standard to be emulated, or merely admired? They aren’t clear, and maybe that’s a problem. At the end of the day, I’m not more likely to lace up my climbing shoes and go ropeless somewhere just because I’ve watched this video. But I’m maybe not most people. As Alex Honnold continues to push the boundaries of his own endurance, are people going to follow in his footsteps, perhaps disastrously? And do media outlets like National Geographic or The North Face have a responsibility to prevent this kind of disaster? This post is purely the product of Erin’s thinking-out-loud and solicitation of discussion. It does not reflect the opinions of Peak Experiences as a company nor any of its staff, although if staff want to weigh in, please do! This entry was posted in Discussion, Uncategorized and tagged Alex Honnold, Discussion, news. Bookmark the permalink. Alex Honnold has been climbing for almost 20 years, and has been soloing for over half that. How come we’re just raising these questions now? Oh yeah, he’s been in Citibank and scotch commercials. Why didn’t anyone have this discussion when Andy Lewis became famous after the superbowl and Madonna? The things he does are every bit as sensational and death-defying as what Honnold does. Truth be told, “sketchy” Andy probably pushes the limit far more often than Alex Honnold. So why all the hubbub about Honnold? The answer? Marketing. This isn’t about role models, responsibility, or risk, this is about assuaging guilt and freeing oneself or one’s company from liability and/or guilt. Climbers have been soloing for decades. John Bachar, Todd Skinner, Dan Osman to name a few. They are all dead, albeit not all from soloing. But, with the exception of Skinner, it can be said that they died from pushing the limits of a fringe sport. The same could be said for BASE jumping, race car driving, kayaking over waterfalls, and mountain biking in extreme terrain. But, we’re not talking about these guys and gals are we? And why? Because they’re not in commercials that are widely televised by a bank, and they’re not often seen on the covers of magazines- save those that are published specifically for the sport itself. Every athlete involved in every one of these sports will tell you that mentorship is important. They will also likely tell you that there is a very pronounced and imperative ethos to learning and becoming experienced in these sports. They might also point out that these things are not provided by a college or an agent or an organization because there aren’t huge dollar signs attached to these activities like there are in conventional sports (baseball, basketball, football). What is attached is a considerable level or risk, adventure, fulfillment and sense of accomplishment. The risk and danger elevates it to another level. They don’t do it for the fans, they don’t do it for the dollars for there are none to be had- they do it because it is there to be done by those that step up to the challenge. So, if you want to have this discussion, have the discussion about marketing and profit first. For if you skip that conversation, then we may as well just legislate ourselves into nice, neat, safe little categorized boxes. No thanks. Hey Jake – I’m not sure if you’re frustrated as this post or at the general attitude, so I’d love some clarification before I address your points, in case they aren’t meant for me. The reason I’m posting about it today is because I was having the conversation a few weeks ago. Of course, the dialogue about extreme sports has been open as long as people have been competing in extreme sports. I was hoping to generate some discussion on a lazy Saturday. A point that was made in a different forum is that Alex doesn’t seem to do any of this for the profit – yes, he has profited from the CitiBank commercial and NatGeo exposure, but when I met him four years ago he was living out of his van…and as far as I know he still is. He’s doing something he loves and it has caught the attention of the mainstream media – that’s not his doing nor it is his fault, but I believe it is worth having a discussion over how the media should handle it. When you say “the discussion about marketing and profit” as a counterpoint to “legislating ourselves into…boxes,” I’m not entirely sure what you mean. I wasn’t trying to bring in the potential legal consequences if someone gets hurt doing something they saw Honnold doing – I was asking more of a general question about the duty of that media to report accurately the risks versus the desire to sensationalize – which I suppose is what you’re so fired up about. Does that make sense? It sounds like we’re having different conversations, although I do see the value in both of them. No, not frustrated at you at all Erin. I quite enjoyed your posting. I’m frustrated at the general attitude from outsiders that know little or nothing about the sport, but whose influence on the sport has some impact- in fact, quite a bit in some cases. Case in point- Hawaii, and the recent attempt there at banning climbing outright. If I came off as crass or negative, it was not my intention. There are some valid questions for sure, I just think the conversation needs to be addressed at the proper starting point. For me, that’s exploitation and its effects, rather than the effects of one athlete’s actions and the influence they may or may not have on other participants in the sport or on the sport as a whole. You weren’t crass or negative, but I spend enough time on the Internet that I’ve learned to double-check before I assume people are mad at me 🙂 Thanks for the clarification – I’m gonna address your other points below your other comment. To my point- it is simply this: No one was really aware of Honnold and his soloing until marketing got ahold of him. I know he has profited off his endeavors, and rightly so. So, in essence, is it the athlete that’s directly responsible for his actions being exposed to the world in a very public fashion, or is it TNF, Citibank, and his other sponsors that have elevated his visibility, and correlatively inspired these questions about responsibility. After all, he was soloing and pushing the limits long before he became a household name. With the legislation comment- I mean that if we answer yes to sponsors having a responsibility to try to somehow prevent these things, then how is that accomplished? By assigning liability if something bad happens? By forcing them to institute education programs? These things can only be accomplished by introducing legislation and then enforcing it. I mean to say that I’d rather not see that happen. By and large I think that climbers are remarkably a self-governing sect of “fringe sport” athletes. I quite enjoy that aspect of climbing. The learning curve is steep and the consequences of skipping parts of the process can be unforgiving. This is half the attraction though, and if we start saying that more accountability needs to be assigned for personal choices, that’s a road we may not be able to reverse. I agree with you that it sounds like we were having two different conversations. I was attempting to address your points but my brain sometimes takes me on tangents that aren’t easily followed and don’t seem all that coherent. Apologies. Your questions are definitely valid, I was just hoping to raise some myself because they relate to the ones you asked as well. 2. I get it now. I think there may be a middle ground between legislative accountability and none, but I do agree that it’s likely the pendulum would swing really far in the former direction. On the one hand, I kind of like the idea of videos like that TNF one making it clear that Honnold is at the fringe AND incredibly competent AND fallible, but at the same time I get spiky when it comes to paternalistic regulations and warnings. I want to believe people aren’t foolish or litigious but…we can be. 3. I think you’re right that the media’s attention to Honnold means everyone gets an opinion. (Although does the CitiBank ad have anything to do with his freesoloing? He had a rope in that ad, and unless you knew him/did the research you might not have made the connection. I’m not sure either way.) I think where I’m coming from with this big-picture question is that the recent media attention to Honnold is unavoidable…but is it good or bad for the sport/us? Does it put us in a position where we have to either disavow or embrace his risk-taking whenever we tell non-climbers what we do? In other words: is it good or bad for our sport that he has this visibility? Thanks for the discussion 🙂 Like I said elsewhere, I’m honestly not sure where I fall on any of this, so it’s fun to chat about it.